Giovanni Solinas’ first shot at silverware as Kaizer Chiefs coach disappeared into the Soweto air on Saturday night after his team were beaten 1-0 by SuperSport United in a second leg MTN8 semi-final encounter at the FNB Stadium. Saturday’s victory, secured via a 58th minute Bradley Grobler strike, brought about a 3-2 aggregate win for the Tshwane side after last weekend’s 2-2 draw and was probably a fair reflection of a game in which Amakhosi struggled to find much spark up front. The first half was a lively affair with good chances for both sides to score, starting when SuperSport defender Clayton Daniels struck the post with a 14th minute header from an Aubrey Modiba free kick. The visitors had another decent opportunity in the 26th minute when the ball fell kindly for Evans Rusike just inside the box, but he scuffed his shot into the ground. 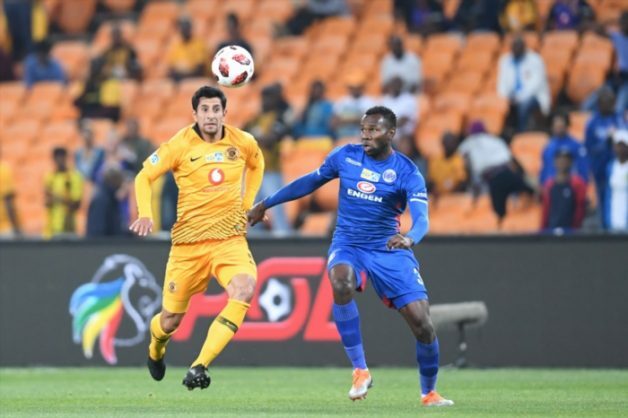 Chiefs were struggling to penetrate the SuperSport defence and their first shot on goal took 28 minutes to arrive, with Leonardo Castro’s long range effort providing an easy save for Ronwen Williams. Amakhosi did, however, grow stronger in the 10 minutes leading up to the break and they were nearly ahead in the 41st minute when Castro pulled the ball back for Willard Katsande, whose first time shot whistled narrowly wide of the far post. Matsatsantsa took the lead 13 minutes into the second stanza after Reneilwe Letsholonyane went on a storming run and then squared the ball for Grobler, who did superbly to go past Chiefs defender Teenage Hadebe before finishing sharply with an angled half-volley to take his tally to three goals over the two-legged semi-final. It took some heroic defending six minutes later for SuperSport to keep their lead intact after Williams made a superb reflex save on a close range shot from Ramahlwe Mphahlele, which he followed up with a point-blank stop on Katsande before Rusike cleared the rebound off the line. The Glamour Boys continued to press for a goal and more chances followed, but Dumisani Zuma miscued from inside the box before Siphelele Ntshangase flashed an effort marginally wide with 12 minutes to play. The closing stages of the game saw Chiefs camped around the SuperSport box. But some resolute defending from Kaitano Tembo’s men got them through to the finish line without much issue as they remain on track to defend their MTN8 title. Amakhosi’s record this season now stands at one win from eight matches in league and cup.